All measurements are somewhat approximate, could be a few 100ths off one way or the other. So from this somewhat scientific survey, it appears to me that 1987 was the switchover to the larger diameter spindle, which means that the hubs of the variety on the left and in the middle will work on the early spindle. I confirmed this by fitting them up to the 924S spindle. And by the way, Vaughan Scott is running hubs from a 1986 944 with early spindles on his race car, so I know this combo works. Dan, interesting fact to know that the 86' 951 had the thinner 31.72mm spindles. i too can confirm that the 86' 944 hubs/spindles are interchangable with the preceeding models inc the 931. they are identical apart from having no hole drilled through them for the speedo cable. Yes, that's a good idea...the only thing I can't weigh though is the later style rotor cuz I don't have one of those. Since they're all disassembled, I'll weigh each piece individually, then we can add it up. cheers, no problem i can weigh the later 944N/A set-up aswell. Here are the measurements I took last night, indicating that there are at least four different variations on the spindles (differences highlighted in bold red italics). All measurements are approximate. Center-to-center numbers were calculated by measuring the furthest distance between the bolt holes, and then subtracting the diameter of one bolt hole from the total distance. What I'm missing is a post-87 951 setup, but according to PET, it's the same as the NA; I'm also missing the so-called M030/758 option, which I suspect is the same as the NA except for the caliper bolting arrangement, which I suspect is the 94mm arrangement to accommodate the Brembos. 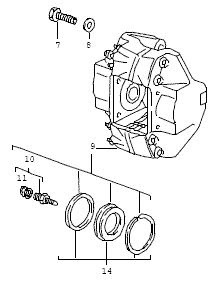 However, I can't be certain of this because I do not have an example spindle nor do I have an example Brembo, and PET shows a different part number suffix for the post 87 Brembo caliper than the 86 Brembos. So, until we get one of these setups in somebody's hands that can measure, the jury is out on the M030 stuff. I also did some approximate weighing. I do not have a sufficient scale to do this with any precision, so these figures are strictly estimates, but interesting nonetheless. I forgot to weigh the calipers, which will make this info complete, but I can do that tonight and post an update later. M030/758 ? ? ? ? Everything was weighed in PAIRS, so individual pieces will be approximately half of what is listed above. The hubs were weighed with studs, locking nuts, and bearings intact. It occurred to me this morning that I might want to go back and verify the dimensions of the tie rod connector on the spindle, as well as the ball joint attachment geometry, as these could be different as well. I'll do that this evening. Some observations and conclusions to follow. Based on the part numbers, I believe anyone doing a five lug conversion that wishes to retain the mechanical speedometer arrangement MUST source from one of the following platforms: any early 924 with the M471 4-wheel disc option (introduced as an option on 931's in 1979, available as options on NAs beginning in 1981, standard on 1981 and later 931's); any 1986-1988 924S; and any 1983-1985.5 944. The 1986 NA appears to have the same part number, but it's not clear if it came with the speedo cable hole. I have at least two examples of 944 spindles from unknown years that match all of the measurements listed for the early 944's, but do NOT have the speedo cable hole. With the introduction of the 951 in 1986, there appears to be a spindle and hub combination that is unique to that year. According to what I can see in PET, the Brembo 4-pot fixed calipers were standard on the 1986 951 (i.e. not an option). This required a spindle that is essentially identical to the NA version except for the caliper bolt pattern. Furthermore, the hub for the 1986 951 appears to be unique to that year. As depicted earlier in the thread, the depth of the backside of the hub is approximately .5" or 12mm shorter than the NA hub, even though the rest of the geometry is essentially identical. This was to accommodate a much larger brake disc, which not only has a deeper hat, but a larger overall diameter. 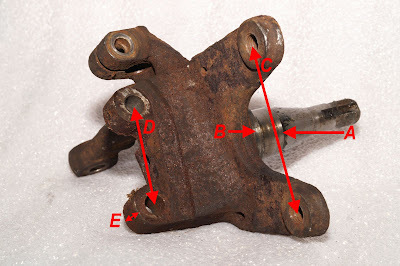 For now, and until I can confirm this conclusively, I think it is best to assume that the 1986 951 hub is not compatible with the early style cast iron calipers due to a much thicker disc surface and a much larger diameter. Consequently, the 1986 951 spindle and hub arrangement is not an ideal conversion IF you wish to maintain a mechanical speedo and stock 924 strut housing. From what I can tell, all non-M030/758 cars from 1987 onward (or at least thru 1990...I haven't done exhaustive research on the post-1990 cars) have the same spindles whether NA or Turbo. This includes cars with the ABS option. Still need to finish the above, but I think I have solved the mystery of the spindles and brake calipers, with the help of a friend in the VW community. Now, the interesting thing is that the calipers I photographed are two pot steel calipers, and my VW friend said they appeared to be early 911 calipers which are known to have the 89mm spacing that I identified on these spindles and matching calipers, sent me some pix of some he'd converted to run on a VW, and they look very similar (although not identical). However, reading more carefully on the D-Prod history page, it indicates that the D-Prods ran 930 brakes. So, I am surmising that these bits are D-Prod. Hubs are standard early 5-lug. Very interesting Thanks for sharing. You have endless energy! !